D3 Breaks a Video Game Trend? Discussion in 'Diablo 3 General Discussion' started by Flux, Jul 11, 2010. Saw this image on a funny picture site, and it cried out to me. So, can D3 actually defy this? The Barb is too old, the Monk has no hair (and is too old? ), the Wizard is Asian and younger, and the WD is older and (Black? Caribbean? Indian?) He's not white and 30, at least. Of course there's a 5th character yet to come, and if the archer/rogue is what we all expect... we may yet get our 30ish white male. Still, 1/5 isn't bad, when you're aiming to miss a tiresome trend. Re: D3 Breaks a Video Game Trend? I don't think D3 will have 30ish brown haired white character but i truely know why these games use these type of characters. 30ish brown haired white men are the most common type of human beings in the world. Although players are younger, they can see their matured future there. This way, it's easy for them to think they can be one of them one day. 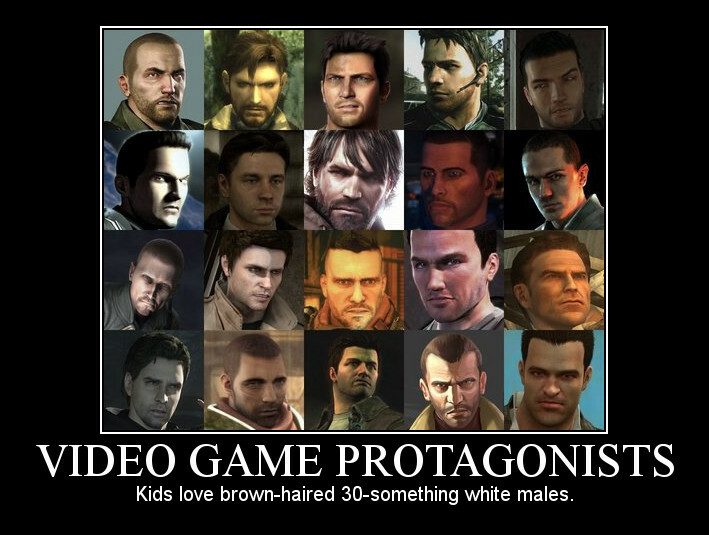 i would be impressed if anyone could name all 20 protagonists and their respective games. I, for one, know only two games, and don't know the names for either character. . . But, those guys are all brooding and moody...like someone we all know who dual wields. The Barb is made up of many other trends, even if he avoids one. You know it's trendy to death when Star Wars does it. Most of them are from console games: Nathan Drake from Uncharted, Michael Thornton from Alpha Protocol, Sam Fisher from Splinter Cell, Commander Shepard from Mass Effect, Alan Wake from Alan Wake and Niko Bellic from GTA4). The rest look so generic I honestly can't tell if I've ever seen them before. Oh, and the scar across one eye thing is so overdone. Solid Snake created at least the half of the characters shown in that picture, including great part of theyr attitud and personality too! Also permaximum is absolutly right, its more a psicological thing, not about a trend. Still it wouldnt surprise me if the next character is a blondish style, we got bald, black and white haired characters...the zon used to be a great blond hot babeÂ°! Dunno how customizable the characters are in those other games (not much, I expect, cause they're shooters afaik), but who on earth uses the default Shepard? MY Commander Shepard was female and Southeast Asian/Javanese. From what I have seen, everyone's Shepard tends to look a bit similar to the default one, to the point where you can tell it's Shepard even if you don't recognize anything else from the picture. Mine was female too but still resembled the default because I couldn't make her both different and attractive at the same time. P.S: hey lots of posts in these days Flux! That statistic is wrong. Chinese males are the most common. I wonder why there are so few blonde males? Am I being crazy, or would people cry foul and accuse designers of supporting the notion of a superior Aryan race (killing machine, thoughts of nazi supermen, too contraversial?) I mean, in the 80's there were blond macho guys in arcade and console games all the time. Where are they now? Blonde hair and long hair aren't that common, and it's probably more about graphics issues. Blonde wouldn't show up as well or provide as much contrast against the pink faces. And long hair is much more work to animate, compared to just sticking a few polygons on top and giving it a texture. I think the 30 years old brown guy is also the typical "adventure movie" character that we get accustomed to in so many movies or TV shows. So the video game designers are using this type of characters as the hero of adventure or action games (which are most of the games around). Concerning the presence of brown rather than blond character, I think we also have some stereotypes here. I think in our mind a guy with brown hair is a better representation of a "male" adult character. Blond hair could be associated to a younger character. We could also have the same kind of stereotypes for brown and blond girl characters. Of course there are examples that completely contradict that: Craig as James Bond, Sutherland as Jack Bauer... but I think this is a minority compared to the vast number of characters that are brown. Of course this could simply be related to the fact that there are less blond than brown persons. But I think it is a bit more than that and that the brown/dark color is "favored" as the representation of an adult guy. I never noticed the trend before. Kind of funny though. Also, bottom row, 2nd to the right I think is the guy from Red Faction? Can't think of his name right now, as I've only been into the second mission or so on Guerilla. Most developers probably fit into that category which is why. That being said. I am not a black Male but I think the Witch Doctor is by far the coolest character in Diablo 3 atm. So I don't think it has all that much to do with skin tone or gender even (remember lots of sorcs are around and most are probably male! ).